Istanbul, Turkey (BBN) – At least 28 people have been killed and 60 others wounded in a terror attack on Istanbul Ataturk Airport in Turkey, Istanbul Gov. Vasip Sahin told Turkey’s state-run news agency TRT. Three bombers were also killed, the governor said. Another report, from semi-official news agency Anadolu, said six of the wounded are in critical condition. A total of 49 ambulances were sent to the site. There has been no immediate claim of responsibility, reports CNN. Turkey’s Justice Minister Bekir Bozdag earlier said one attacker “first opened fire with a Kalashnikov then detonated himself” at the airport entrance. In total three bombs exploded, the governor told TRT. One of them was located just outside a terminal on the pavement, while the other was at the security gate at the entrance to the airport, Bozdag told CNN. 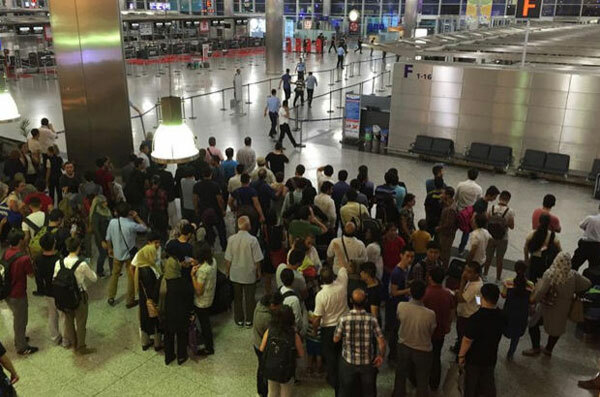 Authorities said no bombs exploded within airport buildings, according to the minister. A video posted to Twitter shows a view from a camera inside an airport terminal. A few dozen people are walking around when a bright flash and fireball erupt in the background. A Turkish official told CNN that police fired shots at suspects near the international terminal in an effort to neutralize them. Videos posted on social media show travelers sitting on the airport floor. A man shouts, “Get down! Get down!” Someone cries as a gunshot rings out. The U.S. embassy in Ankara, the Turkish capital, is sending consular officers to the airport to account for any potential U.S. victims. But there are no indications of any American casualties at this point, a senior State Department official told CNN’s Elise Labott.